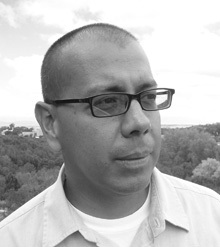 Dr. Jesse Alemán is a Professor of English and a Presidential Teaching Fellow at the University of New Mexico. His work covers nineteenth-century American literature and US Latino/a literary histories. He has published two dozen articles and essays, including recent pieces in American Literary History, The Cambridge History of Latina/o Literature, and Latino/a Literature in the Classroom. He republished The Woman in Battle (U of Wisconsin Press, 2003), which recounts the life and adventures Loreta Janeta Velazquez, a Cuban woman who cross-dressed as a Confederate. He also co-edited (with Shelley Streeby) Empire and the Literature of Sensation (Rutgers UP 2007), and he recently published (with Rodrigo Lazo) The Latino Nineteenth Century (NYU 2016). He is currently writing Latino/a Civil Wars, a book that places US Latino/a writings about the Civil War in relation to simultaneous conflicts in Cuba and Mexico. He is the recipient of the University of New Mexico’s College of Arts and Sciences’ Award for Teaching Excellence; the American Indian Student Services’ STARS Award; the Wertheim Award for Outstanding English Faculty member; and he’s been named Outstanding Faculty Member by the English Graduate Student Association and UNM’s Peer Mentoring for Graduate Students of Color. As a former faculty member of Middlebury College’s Bread Loaf School of English, he was awarded the Ruth and Lillian Marino Endowed Chair for teaching excellence, and in 2016, UNM named him a Presidential Teaching Fellow, the highest teaching recognition the university bestows to its faculty.